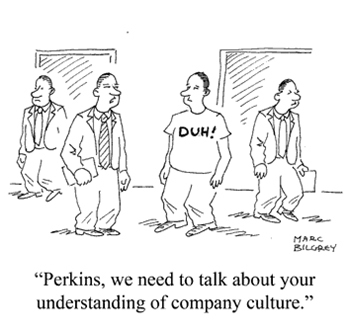 What does your organizational culture say about you and your business? The organizational culture of a company constitutes a number of different values and attitudes that dictate the way people working for that company act and think, and serves as an important tool in promoting unity and teamwork. The long term success of any organization has a lot to do with its culture. According to the Merriam Webster Dictionary, culture is “a set of shared attitudes, values, goals, and practices that characterizes an institution or organization.” Culture is ‘top-down,’ meaning it needs to start at the top. The head of the business, organization, church sets the tone for the why, how, and what that the staff or leadership team will follow. Every organization has its own culture. Since many employees spend 40 or more hours at their workplace, their organization’s culture obviously affects both their work lives as well as their personal lives. An organization’s culture may be one of its strongest assets or its biggest liability. In fact, it has been argued that organizations that have a rare and hard-to-imitate culture enjoy a competitive advantage. Clearly state your vision, mission and values for your business or organization. Over and over. Be clear about what will and will not be tolerated. Have regular reviews of where your business or organization is regarding your vision, mission and values. Share your thoughts on the culture with your staff and leadership team. Connect to the people that you are servicing to make sure that the culture you are creating is appropriate for their needs. Seeing you interacting with your people is also setting a good example for your staff or leadership team. Recognize the people who are doing their part to live out the vision, mission and values of your business or organization. Do this at every possible opportunity – meetings, emails, bulletin boards, social gatherings. The more you recognize, the more charged your staff and leadership team will be to do their part. The culture of the organization should always be learning and developing. Organizational culture is an important aspect that management needs to take into account when making decisions and writing policies. It is important for every organization to establish the right culture to ensure its goals and objectives are met. At Porath Print Source, we take your corporate culture into consideration as we guide your print needs from concept, to design, to implementation. We are your one source for anything printed! Contact us at 216-626-0060 to discuss your project needs, or visit our website at www.porathprintsource.com . We are ready and eager to guide you in thinking outside the box. This entry was posted in Marketing, workplace and tagged organizational culture, out of the box, productivity, workflow, workforce. Bookmark the permalink.